Let’s be honest, the Tokyo Auto Salon isn’t exactly known for its high number of classic vehicles. Instead it’s known for all the utter insanity of its modification. When a classic shows up, it sticks out. And the WWork rich blue Triumph TR3A is a Rembrandt at a hipster modern art gallery. WWork or (Work Wheels, because the W for wheels somehow gets moved to the front for its shortened name) is a custom wheels distributor. They were present at Tokyo Auto Salon to hawk all of the many fine options for wheels that they carry. So, of course, they put their shoes on a classic car like the TR3A for the wow factor and to attract eyes to their booths. Yet, while it is definitely clear that WWork made some changes to the TR3A, and of course, its own signature wheels can be found adorning the underside of the lines of this bygone design language, the original beauty still shines through. It looks both obviously of another era and yet completely at home in ours. And the color choice was decidedly a good decision. While it’s true, I think, that with classic roadsters, one might be drawn to a bright fire engine red, I’m glad that WWork didn’t go that route with this TR3A. The red tail lights would have been lost in a bright red paint scheme. On the blue, however, they jump out, adding depth and character to the color difference. 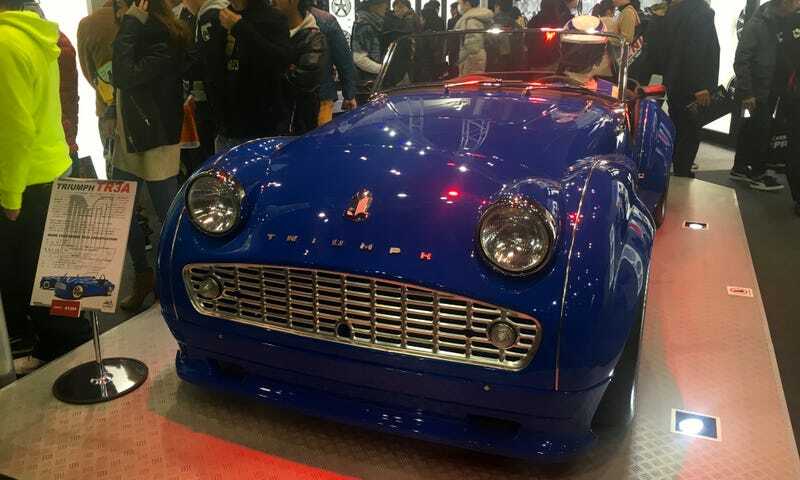 Yes, it’s true, when you go to a show like Tokyo Auto Salon, with its heavy emphasis on the newest models and the craziest modifications, you just don’t expect to see beautifully preserved classics like the TR3A. Which makes it all the more special when you do.